David Goldman, Ph.D., columnist for Asia Times and principal of Asia Times Holdings, will be the luncheon keynote speaker at the Farm Foundation trade conference, Agricultural Trade in a Time of Uncertainty. The April 30, 2019, conference will be at the DoubleTree Hotel Crystal City, Arlington, VA. Review the full trade conference agenda. “We are excited to have Dr. Goldman join us to share his perspectives on the current geopolitical landscape,” says Megan Provost, Farm Foundation’s Vice President of Policy and Programs. 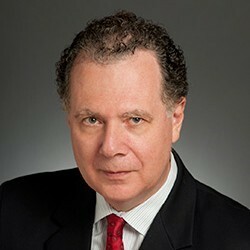 Goldman is recognized for his series of online essays in the Asia Times, written under the pseudonym Spengler, and the Spengler blog at PJ Media. He is the author of the 2011 book, How Civilizations Die. He is a Senior Fellow at the London Center for Policy Research. Previously, he headed research groups at Credit Suisse, Bank of America and Cantor Fitzgerald. From 2013 to 2016, he was a partner at Reorient Group, a Hong Kong investment bank. The April 30 trade conference will open at 8:30 a.m. with video remarks from Roberto Azevêdo, Director-General of the World Trade Organization (WTO). Immediately following, Ambassador Alan Wolff, Deputy Director-General of the WTO, will be part of a panel discussing U.S. agriculture and the WTO, including the role of developing countries and its long-term future given the current proliferation of bilateral and regional trade agreements. Joining Wolff on the panel will be Chad Bown of the Peterson Institute of International Economics and Evan Rogerson of Nanyang Technological University. Joe Glauber, Ph.D., a senior fellow at the International Food Policy Research Institute, will moderate the discussion. This conference will also feature key leaders from Congress and the Administration. Discussing the Administration’s approach to food and agricultural trade are Ted McKinney, USDA Under Secretary for Trade and Foreign Agricultural Affairs, and Gregg Doud, Chief Agricultural Negotiator in the Office of the U.S. Trade Representative. Other topics for the day-long conference include the intricacies of free trade agreements, the impacts of trade wars and retaliatory trade measures on the farm economy, and how sanitary and phytosanitary challenges are impacting global food and agricultural trade. Registration is open for the conference. The $75 registration fee is waived for the media and government employees. This is the first conference hosted by Farm Foundation’s Food and Agricultural Trade Resource Center. The Resource Center was created to bring clarity to trade discussions and enable productive debate and dialogue on trade policy issues. The U.S. food and agriculture sector is entering a very volatile period in international trade, during which it risks losing much of the trade gains achieved over the past three decades. But, if the United States-Mexico-Canada Agreement (USMCA) is approved, if the current trade war ends, and if the United States rejoins the Trans-Pacific Partnership (TPP), U.S. food and agriculture could see not only the gains of the past decades reinforced but could also realize the potential for additional trade gains. Meanwhile, the Canadian food and agriculture sector is set to take advantage of some of those potential losses. Those are among the findings of two analyses released at the Farm Foundation Forum March 4, 2018, in Washington, D.C. The first analysis, completed by agricultural economists Maksym Chepeliev, Ph.D., Wallace E. Tyner, Ph.D., and Dominique van der Mensbrugghe, Ph.D., at Purdue University focused on How Differing Trade Policies May Impact U.S. Agriculture: The Potential Economic Impacts of TPP, USMCA and NAFTA. The second analysis, completed by Don Buckingham, Ph.D., and Al Mussell of the Canadian Agri-Food Policy Institute (CAPI), focused on The CPTPP and Benefits to Canadian Agriculture. The Purdue analysis provides a quantitative assessment of the possible impacts on U.S. agriculture from different trade policy regimes in a volatile trade policy context. The assessment is based on the GTAP model, a standard tool in the arsenal of available tools in quantifying economics impacts of changes in trade policies. This paper is an extension of an analysis commissioned by Farm Foundation in October 2018. The analysis was expanded to examine additional and potential scenarios as events continue to evolve in the trade arena. Even with the previously estimated $454 million in increased exports for U.S. farmers under the USMCA, the sector is still facing strong headwinds and the possibility of a significant loss of export revenues. According to this study, the United States’ withdrawal from the TPP and the subsequent implementation of the Comprehensive and Progressive Agreement for Trans-Pacific Partnership (CPTPP or TPP11) reduces U.S. food and agricultural exports by $1.8 billion a year. Following trade liberalization between the 11 remaining TPP members, there is an increase in trade within those countries, which substitutes away from U.S.-based imports and causes a corresponding loss in U.S. export markets. However, if the United States were to rejoin the original TPP, the agreement would significantly benefit U.S. farmers – the loss of $1.8 billion would turn into a gain of $2.9 billion in additional agricultural exports. The Purdue economists also assessed the estimated impacts of some of the more protectionist trade policies the United States has implemented and could potentially implement in the future. One example was the imposition of tariffs on steel and aluminum and subsequent retaliatory tariffs implemented by key trading partners—in particular, Canada, China, the European Union and Mexico—will cause U.S. agricultural exports to decline by around $8.4 billion. Another potential scenario addressed in the analysis is a complete withdrawal from NAFTA, with tariffs reverting to MFN levels, which would create a decline in U.S. agricultural exports of more than $12 billion. The combination of policies—U.S. withdrawal from TPP, global retaliatory tariffs, and if the United States were to entirely withdraw from NAFTA—would realize a potential a drop in U.S. agricultural exports of $21.8 billion. These negative trade impacts would be reflected in lower incomes for U.S. farmers, reduced agricultural land returns and farm labor displacement. How Differing Trade Policies May Impact U.S. Agriculture: The Potential Economic Impacts of TPP, USMCA and NAFTA, by Purdue University economists Maksym Chepeliev, Ph.D.; Wallace E. Tyner, Ph.D.; and Dominique van der Mensbrugghe, Ph.D. The CPTPP and Benefits to Canadian Agriculture, by Don Buckingham, Ph.D., and Al Mussell, the Canadian Agri-Food Policy Institute. Review the October 2018 analysis: How U.S. Agriculture Will Fare Under the USMCA and Retaliatory Tariffs, commissioned by Farm Foundation and completed by Purdue University.